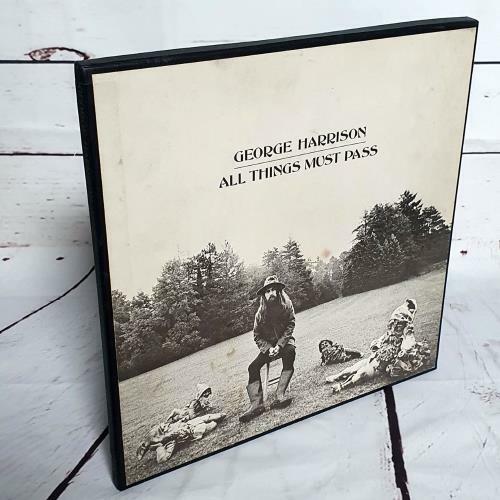 GEORGE HARRISON All Things Must Pass (Classic 1970 UK 23-track triple LP box set with colour coded lyric inners & large fold out poster, housed in a textured & pasted 12" square box. All three inners are US manufactured & the box is a Britishpress with an orange finish. Apart from some slight mottling the box shows very little of its age, the US printed poster is unused and just has a light crease to one corner, the inners has no splits or rips. All three vinyl discs are UK pressed and display only a little light signs of play, overall an excellent example STCH639). or visit our George Harrison image gallery.